A common “running for beginners” topic is stretching. New runners want to know what kind of stretching routine they should have to stay injury free. I think many of us grew up beginning gym class holding a series of stretches for several seconds each, and many new runners assume they should do the same before their runs. Through research and trial-and-error, running coaches have come up with some general suggestions for stretching for runners–what kind of stretches runners should try and when they should do them. 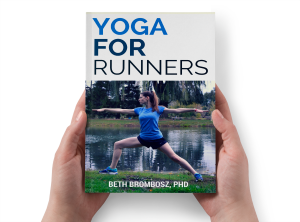 Stretching for Runners – Why? Most runners know that they should stretch but they don’t know why. Stretching helps us maintain a proper range of motion while running. Imbalances in the tightness of muscles side-to-side or front-to-back can lead to injuries, so making sure you have even flexibility on each side of the body is key. Stretching also helps to loosen tight muscles, which just feels nice after a good, hard run, and it can help reduce muscle soreness. Stretching for Runners – When? It’s generally suggested that runners do dynamic stretching before a run and static stretching after a run. Dynamic stretching consists of stretching the muscles while the body is in motion, generally pulling the limb through its range of motion. Elite runner Tina Muir published a lovely post on her site detailing her warmup routine, complete with dynamic stretching, which I highly suggest reading. Static stretching is what most people think of as stretching—holding a stretch for 30 seconds or so. If you choose to stretch after your runs, you should make sure to stretch out all of the major muscle groups that you worked during your run—hamstrings, quads, calves, and glutes. Common post-run stretches include forward folds for hamstrings, holding the foot toward the buttock while standing for quads, lowering your heel off a step or curb to stretch the calves, and variations of pigeon pose to stretch the outer hip and glutes. 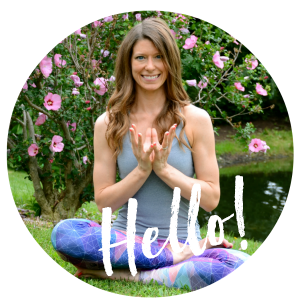 Keep an eye out for my future post with my favorite post-run yoga sequence for a great static stretching routine and more on stretching for runners! For more great tips on running, stretching, and yoga, sign up for my free newsletter! Runners: are you good about stretching after your runs? What are some of your favorite stretches for running? I have realized the importance of training recently. It does make a HUGE difference. I need to start doing it in the next few days, to bring the soreness out of my legs. I think the hip flexor stretch is extremely important for runners, as that can cause lots of other injuries, and is often neglected. I’m terrible about stretching before I go for a run. I’m typically just out the door and running. I keep thinking about doing some dynamic stretching, but it never actually happens. *oops* I’m much better about stretching after a run. Very informative post! I love all of your yoga posts lately 🙂 Dynamic stretching is my favorite! I have to do it before a run and can really tell when I don’t do it. And after running I do yoga and hip openers in my living room. For me…strength training is also vital to staying healthy as a runner. Thank you! I’ve been trying hard to write some quality content recently 🙂 I am a huge, huge fan of post-run yoga–probably my favorite time to practice. Totally agree about strength training + injury prevention–it’s one of the most important things we can do as runners. I always feel funny doing dynamic stretches outside, but I know they are so important. Great post! Thanks! 🙂 I usually do my dynamic stretching in my house for the same reason! Stretching is a must! I’ve been so good about dynamic before and static after. Not perfect but so much better! Excellent! I bet your running is really benefiting from it, too!